Please join us for a poetry reading by Ben Krusling and a presentation of work by CD Wu preceded by pizza & LaCroix and followed by a conversation with the artists. Ben Krusling's writing has appeared in Hyperallergic, The New Inquiry, Black Warrior Review, and other publications. Currently the Provost's Postgraduate Visiting Writer in Poetry at the University of Iowa, he is also a video artist, and the author of a chapbook, GRAPES. CD Wu is an artist of Guatemalan/Taiwanese origin who recently completed his MFA in Painting at the School of the Art Institute of Chicago (SAIC). In December 2016, he had his first major solo show at Shane Campbell Gallery. This August, he and another painter, Omar Velazquez, mounted a joint show, What Did Dinosaurs Taste Like? It Tastes Like Pollo Frito, also with the Shane Campbell Gallery. 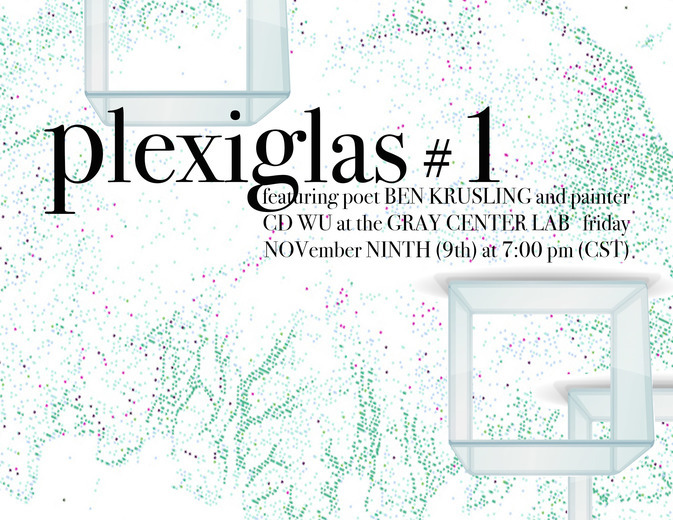 Plexiglas is a platform for emergent poets and artists. Its mission is to promote conversation across disciplinary divides. Events pair writers with visual artists in the hopes of fostering connections across media and of facilitating new creative work. In conjunction with the Gray Center for Arts and Inquiry, Plexiglas introduces the University of Chicago community to new voices and helps students to envision futures in the creative field.